In order to recognize those who work for the Independence of Catalonia and/or its International recognition around the World, Reagrupament Independentista (RCAT) announces the 2012 Friend of Catalonia Award, to be delivered on October 21. This award aims to recognize the behaviour of Non-Catalan people or entities who had worked for the Independence of Catalonia and/or for its international political recognition. The prize consists in a sculpture representing the Homilies d’Organyà. It will be delivered within the framework of RCAT´s Fifth National Assembly, to be held in Vic (Osona). The 2012 Friend of Catalonia Award is awarded by Reagrupament Independentista (hereinafter RCAT) to reward a foreigner that stands out for his/her political support for the independence of Catalonia and / or who has contributed to the international political recognition of Catalonia. - Four members from the Catalan worlds of culture, economics, politics, law, science, arts or sport. - Three members from RCAT National Executive: The President, who shall act as President of the Jury, the National Executive’ International Affairs Officer, and the National Executive Secretary, who shall act as Jury Secretary and Spokesman. - The first four members shall be appointed by the National Executive between Catalan personalities prominent in their respective fields and who have expressed or positioned to favor the independence of Catalonia. - The three members from the National Executive are ex officio members. The jury organize the debate and the mode decision according to its own criteria, in any case must respect the system of majority voting based on the equal of its members. Only in case of a tie the President would have the casting vote. May be submitted by the bid award those foreign individuals that stand out for their political support for the independence of Catalonia and / or who have contributed to the international political recognition of Catalonia. For purposes of this award “a foreign individual” is any person who either objectively belongs to another national community or subjectively recognizes him or herself as a member of another national community. The concurrence of this requirement will be evaluated ultimately by the Jury along the admission process. 1. Legal persons with its HQ located in Catalan territory and the non-profit organizations whose purpose is political, cultural, academic or similar. For example: associations, political parties, Foundations, Universities, Professional Colleges, Academies, etc. 2. Catalan Casals from around the World. 3.The members of the Jury. Nominations shall be submitted in writing to the Secretary of the Jury , either by letter or electronically indicating on the envelope or in the subject field: “2012 Friend of Catalonia Award Nomination“. The postal address to send the envelope is RCAT, c. Roger de Llúria, 5, 08010 Barcelona. Proposals deadline ends at midnight September 30, 2012. 1.Proposer identification. In case of legal persons, in addition to identifying, the proponent will need the declaration of competence sufficient for the organic act of those who signed the proposal. 2. A CV from the candidate. 3.A letter or text that arguments reasons the nominee deserves the award. The Jury will award the prize to a single candidate. Only in exceptional and duly motivated cases can occur in two or more people. The award must be granted. The only reason for not granting it is lack of nominations. The 2012 Friend of Catalonia Award will be delivered during the celebration of RCAT Fifth National Assembly, scheduled for October, 21, 2012, in Vic (Osona). The jury,then, will meet well in advance so that the winner can assist for the delivery. Those jury members not belonging to RCAT, will be invited to the National Assembly. 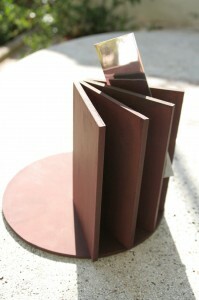 The 2012 Friend of Catalonia award will consist in a reproduction of the sculpture Homilies d’Organyà. Any complaint will be justified in writing before the jury, which resolved in five working days by written and reasoned response. Against the decision may appeal it by filling out the form to RCAT National Executive, which decides on its next ordinary session. This decision, in writing and reasoned, shall be final.